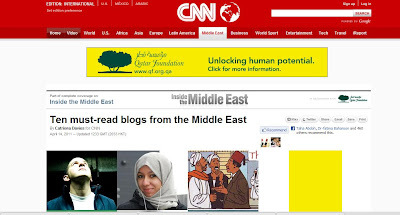 (CNN) -- Political unrest across the Middle East has increased appetite in the wider world for comment from within the region, and some are turning to bloggers for insider views on the events unfolding on their television screens. Social media -- including blogging, Twitter and Facebook -- has played an often-crucial role in organizing the protests sweeping the region. But it's not all politics, and blogs about the ups and downs of daily life can offer a fascinating glimpse of real life in the Middle East. Here, we have drawn up an entirely unscientific list of 10 of the most interesting blogs from the region. The bloggers come from a variety of backgrounds and countries. Our only criteria were that they are based in the region, write mostly in English and have something worth saying. Politics in Egypt and the wider Arab world. Arabist is popular for its insightful comment on Egyptian politics. Often thought provoking, it's a good place to monitor developments in post-revolution Egypt. The principal blogger on this site is Issandr El Amrani, a freelance journalist and commentator for several international publications. El Amrani was born in Morocco, and has lived in Cairo, Egypt, since 2000. The Saudi woman who got tired of reading "expert" opinion on her country Riyadh-based mother of three and post-graduate student Eman Al Nafjan, 32, set up her blog Saudiwoman as a response to reading non-Arabs and non-Saudis giving expert opinions on life and culture in the kingdom. She said: "I felt that I would rather represent myself instead of having others speak for me. There was no long-term plan but eventually I became addicted to it. To me it's an outlet and a way to voice my concerns about everything, including Islamophobia, human rights violations and women's movement in Saudi Arabia, and the Palestinian/Israeli conflict." Saudiwoman was a finalist for Best Asian Blog in the 2011 Bloggies. Mahmood Nasser Al-Yousif, the author of Mahmood's Den, is a long-time blogger who has been described as the region's "Blogfather." Al-Yousif was recently arrested and briefly detained by the Bahraini authorities. He describes his blog as "an Arab man's attempt at bridging the cultural gap. Trying to make a difference. Failing a lot. Succeeding once in a while." Afrah Nasser is a 25-year-old journalist at the Yemen Observer. Nasser has been blogging for just over a year, featuring politics, news and views. Her recent posts have been about the protests in Yemen and include updates from Sanaa's Change Square, a focal point for protest in the capital. She said: "I love to blog about political topics especially since the revo started. It's my gateway to express my views freely. However, that caused me trouble sometimes." Nasser said she recently received a threatening message on her Facebook account. Her response? She just translated it from Arabic to English and posted it on her blog. The Rantings of a Sandmonkey was an anonymous blog until its author Mahmoud Salem went public, saying he had been attacked close to Cairo's Tahrir Square during pro-democracy demonstrations in February this year. Salem said his car was destroyed and he was beaten up by pro-government thugs in the days before the resignation of President Hosni Mubarak. Sandmonkey has just won the best English language blog -- a people's choice award -- in The Bobs, Deutsche Welle's Blog Awards. German broadcaster Deutsche Welle said in its citation: "The activist blogger's witty and courageous writing has called for freedom and democracy in Egypt long before this year's uprising." Naseem Tarawnah, a 24-year-old Masters student, writes the blog BlackIris, named after the national flower of Jordan. Tarawnah, who lives in Amman, wrote on his blog: "From cultural journeys to poetic ramblings, this blog was created, amongst many things, to address Jordanian issues ranging from the political to the social and to chronicle the extraordinary voyage of metamorphosis that this nation has embarked upon." Tarawnah is also co-founder of 7iber, an online citizen media platform in Arabic. Black Iris has won two Brass Crescent Awards for Best Middle Eastern Blog. LivefromGaza: 360 square km of chaos is the work of Lina Al Sharif, a 22-year-old English Literature student at the Islamic University in Gaza. Lina, who started LivefromGaza in 2007, said: "The purpose of my blog is to reflect on the life in Gaza, in general, and on my life particularly. "My blog's biggest achievement has been in giving a chance to the people of Gaza to narrate the situation as experienced by them. "I believe my blog helps me to share and to educate people, not just on the hardships, but also the good times." Amira Al Hussaini is regional editor for North Africa and the Middle East on Global Voices, an international community of bloggers. She has her own blog, called SillyBahrainiGirl, but is more active on Twitter. She says in her blog: "A Bahraini girl is never silly but there are some factions out there who insist that we are not given our place in the society." Mark Makhoul, 32, a creative director at an advertising agency, began his current blog, 248am, in 2005. Mark's wife Nataly Tawil, a designer, makes occasional contributions to the blog. The pair are both Lebanese and live in Kuwait. While it may not offer the political insight of some of the other blogs on the list, it does present a slice of life in Kuwait, covering art, technology and more, with lots of reader contributions. And it's not entirely without controversy ... Makhoul is apparently being sued by a Japanese restaurant chain over a negative review. Cartoonist Maya Zankoul, 24, has gained international attention for her blog, Maya's Amalgam, consisting mainly of her illustrations. Zankoul, who grew up in Saudi Arabia and now works in Lebanon, said: "The workplace in Lebanon was not allowing me to fully express my opinion about the things I was noticing about living in Lebanon and the Lebanese society, so I decided to start my own cartoon series, telling stories from my daily life, from my point of view -- all in illustrations." Maya's Amalgam has been online since 2009 and her blog illustrations have been made into two books.